UPDATED: Thu., March 6, 2014, 8:31 a.m.
More than three-quarters of an inch of rain fell at Spokane International Airport on Wednesday, breaking a more than 60-year-old record and, coupled with melting snow, flooding some area roads. A culvert failure after heavy water flow is being blamed for a road washout north of Hayden Lake. The Kootenai County Sheriff’s Office said the washout on North Rimrock Road created a gap in the roadway 10 feet across and eight feet deep. Two vehicles drove into the crater, and three people were injured. Clifton McMahon, 24, of Hayden; Melissa Ehrmantraut, 31, of Post Falls; and Anthony Moreno, 47, of Coeur d’Alene were all taken to Kootenai Health. Rimrock Road is closed between Lakeview Drive and Lancaster Road while crews work to repair the road, the Sheriff’s Office said. About 150 people in the area are without water, and electric as well as telephone lines may be affected by the work to restore services, according to a news release. Northwest of downtown Coeur d’Alene, flooding has closed West Prairie Avenue between North Atlas and North Huetter roads, the Sheriff’s Office said. 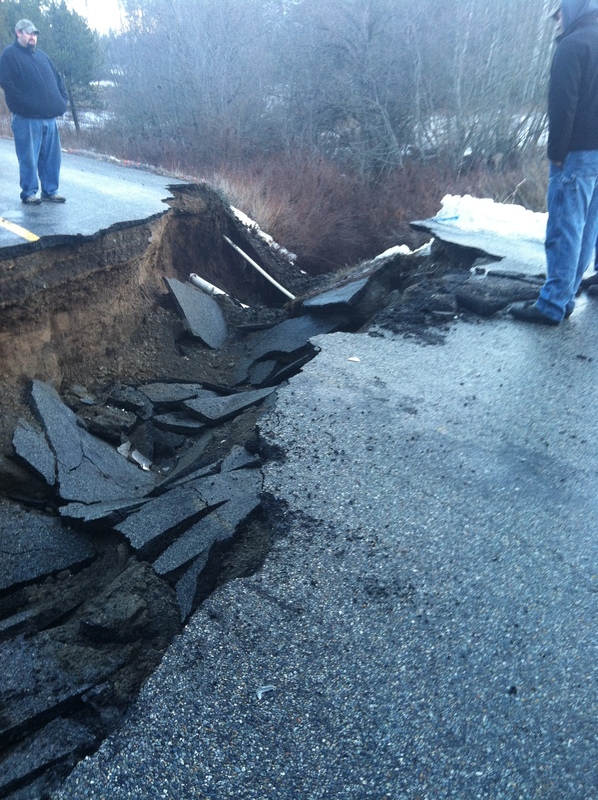 The road is expected to reopen sometime Thursday, according to a news release. The North Idaho College Center in downtown Bonners Ferry is closed today due to flooding, the college announced in a news release. All classes and tutoring sessions at the branch, located at 6791 Main St. in Bonners Ferry, have been canceled. The college did not say if it would be reopening Monday, the next day classes are scheduled. The Washington State Patrol announced a closure of two rural highways in Lincoln County early Thursday. Mud and water at least a foot deep initially covered state routes 23 and 231 north of Sprague, causing traffic to be halted as waters receded. Sections of 231 and 23 were reopened by 8 a.m. after closures starting after midnight, the WSP said. Spokane International Airport reported 0.78 inches of rainfall Wednesday, beating a March 5, 1950, record of 0.66 inches. Wednesday was also the first day high temperatures cracked 50 degrees in Spokane this year. Forecasters say the warmer weather will stick around through the weekend, with highs expected in the upper 40s and lower 50s. Daily rainfall records were also broken at Mullan Pass, Ephrata, Wenatchee, Omak and Chief Joseph Dam, the weather service said. The area remains under a flood advisory through Friday morning. Sunny skies this morning will give way to afternoon rain, with up to a quarter inch expected Thursday, forecasters said. Several rivers and streams were flowing at high levels this morning, but were expected to remain below flood stage. They are the Little Spokane, St. Joe and Palouse rivers along with Latah and Paradise creeks. Forecasters said that continued precipitation and snow melt could result in minor flooding of main rivers next week in North Idaho. Lake Coeur d’Alene is expected to crest about three feet below flood stage by mid-next week, according to current weather forecasts. The Coeur d’Alene River at Cataldo is forecast to crest about 6 inches above flood stage by Friday afternoon. Meanwhile, avalanche danger continued in the mountains. U.S. Highway 12 east of Lewiston remained closed today due to avalanche danger. The closure begins 24 miles east of Kooskia and runs nearly 60 miles through the mountains into Montana, according to the Idaho state Department of Transportation. Published: March 6, 2014, 7:50 a.m. Updated: March 6, 2014, 8:31 a.m.